Following extensive research and development, all grades of net have been designed especially for Australia’s harsh conditions and are manufactured under strict quality control and supervision. We use only the very best quality UV stabilisers and Polyethylene in the production of our nets and carry a 10 year warranty on UV degradation. Click on any of the links below for more information on the specific grade net of your choice. The Premium Plus 45 gram per square metre net is our top of the range product. Its construction of 15mm square mesh prevents birds as small as silver eyes from getting in to your crop. This hexagon weave net weighs 40 grams per square metre and as the name suggests is a hexagon construction net, small enough to protect your crop from silver eyes and other pests. Available in 16mm hexagonal construction in Black or white. This hexagon weave net weighs 33 grams per square metre and is a great economical solution to protecting your valuable crop with most of the great features of the heavier grade nets only less expensive. It is available in 16mm hexagonal weave in black or white. Latest Technology UV Stabilisation using only the best quality raw materials and UV additives. 33 gram, 40 gram and 45 gram weights available. Standard widths of 6, 6.5, 11, 13, 16 and 19 metres. Standard lengths of 50 to 200 metres. Other lengths and widths may be made to size depending on the quantity. Black or White colour, Black being more aesthetically pleasing for those areas where you don’t won’t the net to stand out. Prominent centre line to help with easier application. Extra Strong selvedge allowing for better securing. Packaged to allow first application directly from the bale saving time and money. Delivery organised to your property. 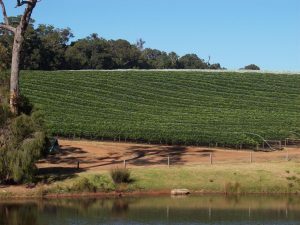 Black Nets provide an aesthetically pleasing coverage to enhance the natural beauty of your vineyard estate allowing a more natural look. It is available in all grades.For those who prefer conventional white nets we can also supply those in all grades.The picture below shows an estate using black nets, which blends in beautifully with the natural surroundings. On the ridge you can see the white nets.